The title’s reference to a ‘complicated system affected by secret or indirect influences’ (OED) is born out in practice. A fun moment provided young Heaney with an entrance into his developing self. Born an intelligent, inquisitive youngster on the family’s rural farm, he enjoyed the thrill of putting his bicycle to experimental use, carefully noting the ‘what-happened’. He discovered the spin, motion around a central axis, force fields, gravity, and deflections dictated by the laws of physics at an early age. The poet’s first experience of working something out for himself (first reaI grip I ever got on things) involved the art of pedaling – not astride his bicycle, rather with the bike upside down on its seat and handlebars and its pedals turned manually at breakneck speed (preternaturally fast). Heaney’s observations led to a keen interest in what was happening: the illusion of see-through (the disappearance of the spokes); see-through generating sound from nothing visible (Hummed with transparency); the invisible presence of spokes demonstrated by the disintegration of solid matter (potato), bits thrown out by centrifugal forces (hooped air); evidence of energy and gravity (Spun mush and drizzle back into your face); destruction of the most flimsy items (straw frittered). He becomes intrinsic to the event, meeting the notion of resistance (pedal treads Worked very palpably at first against you) and the point at which the pedaling hand could no longer keep up – swept ahead into a new momentum. The experience left its mark (entered me) providing a transformative access of free power – Heaney is not yet familiar with the physics of centrifugal force and accepts what happened as true without Newtonian proof: has seen how pedal-thrust throws objects outwards (belief caught up and spun the objects of belief) and extends his farmyard fun beyond earth’s gravity (orbit), to the convergent point that matches his eagerness (coterminous with longing). For young Heaney enough was not enough; observing things as they were (given) just opened further lines of enquiry. The youngster threw earth and water into the mix. A deliberately chosen spot on the family farm: ‘The well’ … more a hole/ With water in it), framed by small hawthorn trees; a pool of muddy ooze, marked by cattle (dungy … all tramped through); a sludgy (turbid sump-life) carrying the whiff of farm-yard machinery (like old chain oil). He sets out the stages: I arrived with bike; I turned it upside down; I stabilized it (soft bottom); brought rubber and water into contact; started to pedal. He makes an immediate visual link (mill-wheel pouring at the treadles), noting that a millwheel is water-driven whilst, here, he is driving the water (reversed) and producing a wild spray (lashing a mare’s tail. He records the sensations: the power of muddy water was invigorating (world-refreshing), its spray delicately visual (lace and dirt-suds there before my eyes); it left its mark on him (showered me), promised renewal (my own regenerate clays). Exhilaration became addictive: the quasi-spiritual halo it produced worked again and again (For weeks I made a nimbus of old glit). Then … harsh reality … nothing is forever (the hub jammed, rims rusted, the chain snapped. the backlash from his venture into abstraction sends Heaney spinning into the primary materiality of dirt (that) cannot resist the abstracting impulse. 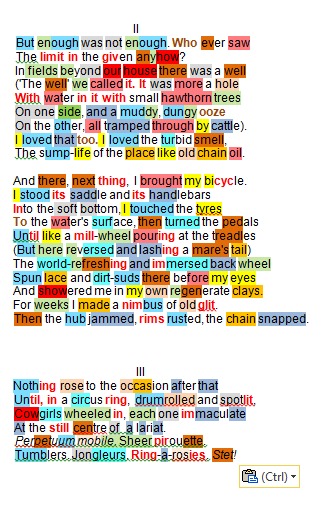 Dirt is made magical by ‘Wheels within Wheels’ … the child who will grow up to be the poet moves his bicycle to a mud-hole; upside down, with its saddle and handlebars submerged, it sends up by its turning wheels a shower of silt … With the terminal snapping of the chain here, and the dis­appearance of the ‘nimbus’, Heaney bids farewell to his most ambitious wish – to join the domain of mud with the domain of vision (HV 144-5). Nothing came close to young Heaney’s exhilaration at the joys of wheel-spinning on the farm until, in a circus ring (everything is circularity) with all its razzmatazz (drumrolled and spotlit) a wild west entertainment featured Cowgirls circling, perfectly turned out (immaculate) each one at the hub of an apparently empty spinning rope (the still centre of a lariat) … perpetual motion (Perpetuum mobile), spin perfection (Sheer pirouette) within a pattern of movement (Tumblers. Jongleurs. Ring-a-rosies); he wishes it could go on forever: Stet! 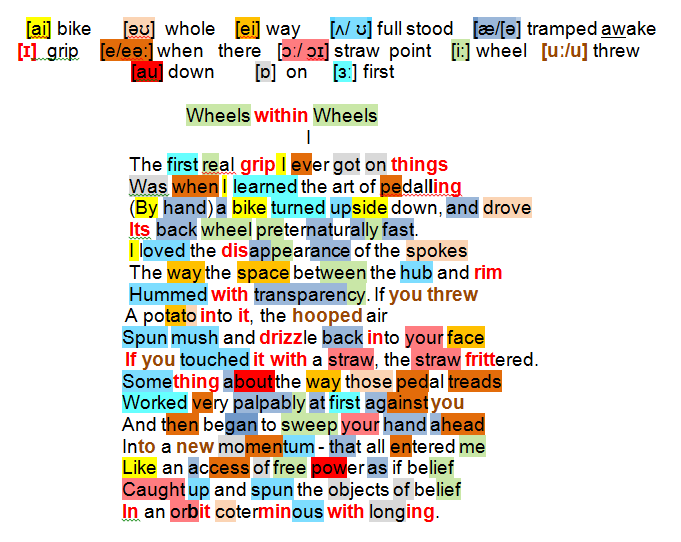 NC 165-6 ‘Wheels within Wheels’ is one example where (via a process of the initial object > vision/ revelatory process) individual texts becoming allegories of their own creation and perfor­mance … In ‘Wheels within Wheels’, this process of transformation is itself figured as an opening or entrance in the developing self, and indeed the verb ‘enter’ and its cognates recur throughout the book. Repeatedly in Seeing Things it is the unpredictability and change­ ability of water and sky which excite the poet and prompt new and unusual angles of vision.